Under the proposed bill, insurance companies would not be allowed to refuse to offer homeowners insurance or renters insurance coverage based on the specific breed of an individual’s dog. The insurer would be prohibited from refusing to issue a policy, renewing a policy, canceling a policy or raising the premium based on the dog’s breed. The bill provides an exception for a dog which has been designated a “dangerous dog,” by a local community. At Breakstone, White & Gluck, our attorneys have represented victims of Massachusetts dog bite attacks for more than 30 years. Massachusetts has a strict law when it comes to dog bites. Under M.G.L. c.140 § 155, a dog owner or keeper is strictly liable for injuries inflicted by a dog. Their homeowners insurance policy typically provides compensation to the victim. With the exception of young children, victims have to show they were not teasing or tormenting a dog or trespassing. Years ago, the cities of Boston, Lowell and Worcester banned certain breeds of dogs, such as pit bills, because they had a reputation for being dangerous. This practice became illegal in Massachusetts in 2012, with passage of St.2012, c.193. Here is a summary of the animal control law written by the Massachusetts Society for Prevention of Cruelty for Animals (MSPCA). Yet certain insurance companies are still asking about dog breeds. At the State House this week, a representative from the Property and Casualty Insurers Association of America said dogs are the industry’s “single biggest loss.” He was testifying before the Joint Committee on Financial Services. Meanwhile, the MSPCA supports the Massachusetts bill, saying breed-specific policies are a bad idea. The organization says a better solution is educating the public and dog owners on dog behaviors. The MSPCA estimates 4.7 million dog bite injuries occur in the U.S. each year, with 800,000 victims requiring medical treatment. 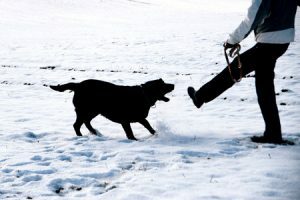 At Breakstone, White & Gluck, we support full compensation for anyone who has been injured by a dog. Young children often suffer dog bite injuries. But others are also at risk. Over the years, our dog bite attorneys have represented clients of all ages who have been bitten suddenly and without warning – including cyclists riding bikes. We have represented clients in the Boston area and across Massachusetts. When a dog bites, medical care is critical – in the hours, days and months following an attack. This medical care comes with other costs. Victims – or family members – may have to take time off from work to receive medical care and deal with the emotional pain and stress of a dog bite attack. Our attorneys have represented those injured by dogs as well as family members who witnessed the terrifying attack and suffered severe emotional distress as a result. It is a long journey back after a dog bite injury and it’s important for insurance companies to provide compensation. Read about our results for clients injured by dog bite attacks in Massachusetts. With over 100 years combined experience, Breakstone, White & Gluck specializes in representing those who have been injured by the negligence and wrongdoing of others in Massachusetts. We are experts in handling dog bite and animal attack cases. If you have been injured, learn your rights. For a free legal consultation, contact us at 800-379-1244 or 617-723-7676 or use our contact form.